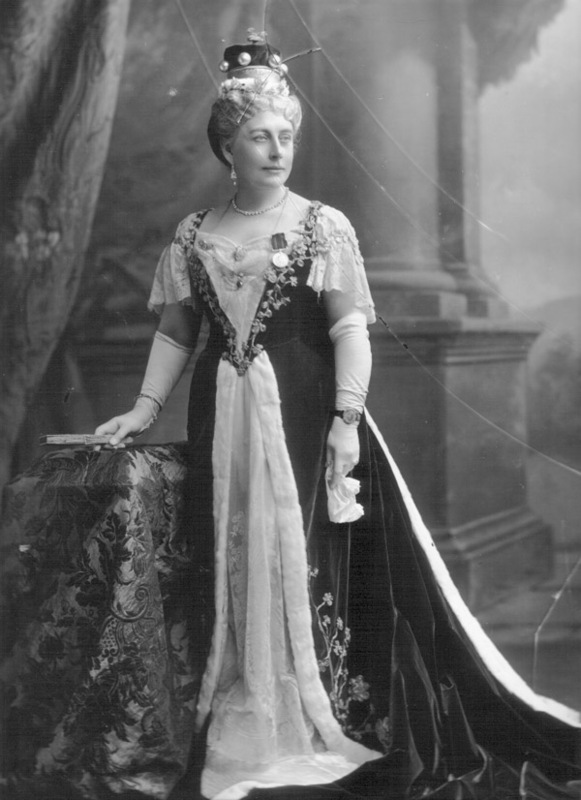 Lady O'Hagan (d 1921), née Alice Mary Towneley. Sitter: Lady O'Hagan (d 1921), née Alice Mary Towneley. Biog: Youngest daughter and co-heir of Col. Charles Towneley, of Townley, Lancs. ; m. (1871), as his 2nd wife, The Rt. Hon. Sir Thomas O'Hagan, 1st Baron O'Hagan. Costume: Coronation robes: "...underdress of old lace, embroidered with gold, [...] the same gold embroidery on the lace sleeves" (The Queen, 16 August 1902, p 257b). Biog: Burke's Peerage; The Times, c. 20 November 1921 [ck]. Costume: The Queen, 16 August 1902, p 257b.